The ParaPod comes in a kit form that can be sized and assembled easily for significantly less than conventional HKAFOs. The kit provides an exoskeleton worn over clothing that consists of shoe clamps, aluminum uprights, foam knee blocks, and upper-back and chest supports. The aluminum uprights are sized at the knee and hip and are cut to length. Additional tubes can be cut to a longer length to accommodate growth. The HealPRO™ is a cost-effective foot and ankle-positioning orthosis designed to unweight the heel, while protecting the foot from potential ulcers and/or loss of dorsiflexion range of motion. HealPRO's unique design reduces pressure on the toes from bed linens, increasing comfort and skin protection. HealPRO is the ideal choice for patients spending long periods of time in a recumbent position. HealPRO can improve clearance in swing phase and promote a neutral position during stance for limited ambulation. The external bootie cover can be used to cover the sole and toes when the patient is out of the bed. Now through June 30, 2009, receive a free 12-can polar-blue custom cooler with every SPS purchase order for any Renegade® family prosthetic foot, including those with the new sandal-toe option. Just in time for warmer weather, the new sandal-toe option allows Renegade users to wear sandals or "flip-flops." Available on all Renegade models in sizes 22-28cm. The polar-blue custom cooler has a unique side-angled lid design with Velcro® opening for easy access to the main compartment. Front slip and micro-mesh pockets, key ring, and metal beverage wrench make it a must for summer activities. Made with durable neoprene and a rugged outer nylon cover, Comfort Endurance™ Suspension Sleeves are tough, rugged, and built to last. They are offered in three styles, black and beige, and in a full range of standard sizes. Custom sizes are also available. 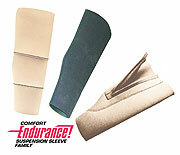 Endurance Criterion offers superior support and comfort and reduces popliteal bunching. 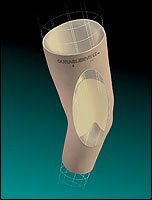 Endurance Sport incorporates a nylon-lined center section to reduce abrasion. Endurance ZipSleeve incorporates a zipper for easy donning and doffing, for those with compromised grip strength. Suspension sleeve products are reimbursable under L-Codes L-5674 and L-5675. We put our feet on trial; now it's your turn, with a 60-day free trial. 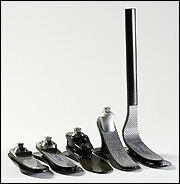 Otto Bock's family of carbon feet offers you everything you look for when selecting a foot for your patient. We test every foot to ISO standards, making sure they stand up to the test of time. We also put them on our functional testing robot to ensure their design and function meets your patient's needs, no matter what the activity level. Select the foot suitable for your patient's needs and let them try it for 60 days*. Like it? Keep it! If not, send it back. Since its introduction, OrtenPIX software has successfully created symmetrical TLSO, BK, and KO files from just two digital pictures. With ActivCurve, Orten's latest upgrade, more pictures can be added for asymmetrical patient shapes. Now, your digital camera becomes a scanner for challenging cases such as scoliosis or complex BK patient files. OrtenPIX is constantly evolving, and remains the most affordable and portable CAD solution. Demonstrations will be available at the AOPA National Assembly September 20-23 in Seattle, Washington, or contact Orten for a demonstration today. Orthofeet's new Women's Summer Shoes combine chic design with a stretchy fit at the forefoot, along with exceptional comfort and excellent breathability. Additionally, their unique two-way fastening strap system allows fastening on either side of the shoe, enabling easy adjustment of the effective length of the strap as well as replacement of the strap with a longer one. ProLab's P3 functionally-corrected prefabs incorporate advanced technology and evidence-based research to produce a high-quality, functional prefabricated foot orthosis. Dycor's new "K Series" K2 Energy Storing foot is ideal for unilateral and bilateral assisted ADL. 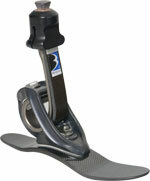 Similar to the "K Series" Flexible keel feet, the "K Series" K2 Energy Storing foot is extremely light and durable (7 oz. including integrated EVA foot shell). The "K Series" K2 Energy Storing foot, relies on plantar flexion, bumper compression, and dorsi-deflection of the semi-rigid thermoplastic keel. Weight limit is 113-295 lb., depending on size. Patent and patent pending. 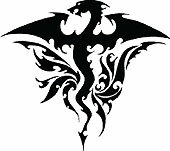 Look for the tattoo transfers on Friddle's website, or call us to receive a free poster, which includes our complete line of transfers. The new enhanced formula of Nano-Res is the first O&P resin in its class to offer a low hazardous-air-pollutant formula. This means lower hazardous emissions, which translates to a safer, more enjoyable work environment. Manufactured by Acsys Orthopedic, Nano-Res uses nano-scale elastomeric elements that function like billions of shock absorbers to help attenuate impact energy. The nano elements create a lamination with unmatched strength and durability. Nano-Res has a 12-15 minute gel time without bubbles, and very good fiber wet out for consistent, reliable results. Bracemasters International LLC serves patient care providers nationwide as a central fabricator of custom orthotic devices. Our latest and most exciting program, the Dynamic Response Ankle Foot Orthosis (DRAFO), will truly revolutionize the O&P industry. The DRAFO is not just a product-it is also a comprehensive program built around a custom orthosis that promotes a more holistic outcome while improving quality of life. Housed in a 3-ring binder, with tabs and a user-friendly master index, the comprehensive catalog features thousands of tools as well as a large assortment of fabrication materials, sheet goods, glues and adhesives, resins, casting supplies, carbon fiber, pigments, and exam-room furniture and equipment. The Tool Catalog and price list are also available on CD. Techform Casting Tape from Ossur. From the simplest AFO to the most complex custom KAFO design, Becker Oregon has evolved and expanded into a full- service central fabrication facility. In addition to its custom orthoses, Becker Oregon offers a selection of prefabricated orthoses for your convenience. Talon, adjustable wrist-driven hand orthosis. Hip Abduction Rotation Orthosis 2000 (HARO). The unique BioQuest PerfectStride II X3 prosthetic foot went through more than five years of product development and testing. It is designed to help patients achieve increased gait velocity and gait symmetry. More ankle and subtalar motion. Ohio Willow Wood's Fusion™ Foot allows the carbon fiber shank, heel, and foot plate to work together through each step rather than independently. This integrated design yields superb performance and strong energy return all in one mechanism. Practitioners can customize the Fusion Foot's inversion/eversion, heel stiffness, and overall trim height for wearer comfort. Two diameters of snubbers may be switched out to provide more or less inversion and eversion. 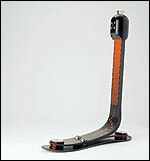 They also allow the bottom of the composite shank and composite heel to run parallel to the foot plate. This allows both to bend and flex, delivering medial/lateral stability on uneven terrain. The Fusion Foot comes standard with two interchangeable heel wedges. The LOMBAR™ is a streamlined, low-profile, customizable orthosis that promotes thoracic extension through targeted vertebral separation. LOMBAR's "aluminum spine" provides strength while conforming intimately to the patient's body to provide stability and pain relief. 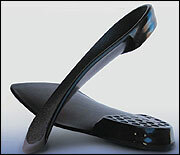 The contoured spine can be further customized without tools. The apron front has Velcro® closure via dual pull tabs with finger pockets for controllable, adjustable abdominal compression. Padded straps are easily adjustable to optimize comfort. 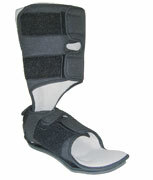 Removable lateral panels allow the brace to be worn with reduced support. Innovative non-twisting strap design makes application and compliance as simple as donning an overcoat. Soft, yet dynamic, the Assure prosthetic foot is an ideal solution for the diabetic and vascular amputee population. The lightweight Assure combines an active heel with a full-length keel to protect the vunerable sound limb. The deceptively simple design addresses the needs of slower walkers while providing the benefits of Flex-Foot technology in a configuration appropriate for basic ambulators. Standard foot cover with an attachment plate. Active heel with cushion wedge. Friddle's Orthopedic is proud to introduce its new line of tattoo on-the-spot transfers. These great black-and-white tattoos come in several shapes and themes, from Celtic crosses and knots to dragons, skulls, and much more! 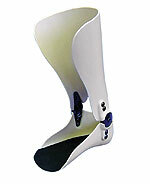 Ohio Willow Wood's Shock Absorber reduces or eliminates impact on a prosthesis at heel strike. This component is ideal for prostheses that include non-energy-storing feet. Rather than an instantaneous impact to the body at heel strike, the Shock Absorber provides a cushion that spreads out the impact at heel strike. The result is a more natural, comfortable gait. The Shock Absorber has a standard pyramid receiver on one end. The opposite end is compatible with 30mm tube clamps. The aluminum tube has a minimum length of 155mm. It comes with three high-performance polyurethane rod inserts for adjusting stiffness. Designed with ease of fabrication in mind, the Camber Axis Technic™ is a cost-effective and durable free-motion ankle joint that is based on the proven technology of the Camber Axis Hinge. Compared to fabricating plastic "overlap" ankle joints, the pre-contoured, stainless steel Technic will reduce your labor time and material costs by providing you with a prefabricated ankle joint that is easy to install. 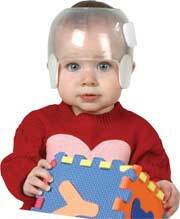 Since 2000, the STAR Family of Cranial Remolding Orthoses has been used to treat positional plagiocephaly, brachycephaly, scaphocephaly, and other head-shape deformities in infants 3-18 months of age. Tens of thousands of infants have been successfully treated with the STARband®, the first cranial remolding orthosis with FDA clearance available to practitioners across the United States and around the globe. And recently, Orthomerica received FDA clearance to become the first cranial-remolding-orthosis manufacturer to provide orthotic management for post-operative craniosynostosis to the O&P profession.